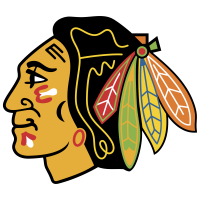 CHICAGO (AP) – Brendan Perlini scored three goals against his former team for his first career hat trick, and the Chicago Blackhawks ripped the Arizona Coyotes 7-1 on Monday night for their third straight win. Patrick Kane fired in his 41st goal as Chicago moved within five points of the second wild card in the Western Conference. Jonathan Toews, Brandon Saad, and Chris Kunitz also scored, and Corey Crawford made 24 saves. Arizona’s Darcy Kuemper made his 10th straight start but was replaced by Calvin Pickard in the second period after giving up four goals on 16 shots. Pickard blocked 15 of 18 shots. The Blackhawks pounced on a couple of Coyotes mistakes to pull away in the second. The goal prompted Arizona coach Rick Tocchet to replace Kuemper with Pickard, but it didn’t slow Chicago’s momentum. After Oliver Ekman-Larsson lost the puck, Kane fired in Artem Anisimov’s feed across the crease at 8:50.